So I was never a fan of green beans for as long as I could remember... until I learned to cook it properly. I now know that I was turned off from green beans as a child because it was an overcooked, ugly green, soggy disaster. 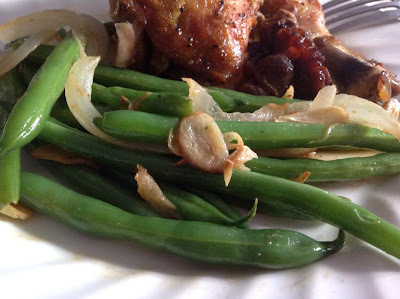 See how I make tasty green beans in less than 12 minutes! In a skillet, heat oil and butter. Add ginger powder and stir to infuse oil . Add garlic, onions and toast lightly then remove from pan and set aside. Using tongs, transfer green beans from ice water and place in your skillet. Keep moving the beans around to ensure even cooking. Cook for 6 minutes then transfer to a serving platter and garnish with toasted garlic and onions.